Afghan Boy's U.S. Surgery A Success: 7-year old with Heart Defect Came to U.S. With Help of U.S. Army Doctor Jonas said Umer owes his life to Maj. T. Sloane Guy, an Army surgeon who took up his cause while on duty in Afghanistan. Guy and others had been working to get Umer to the United States for more than a year. 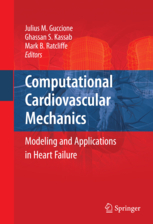 Organized in a two-part structure, this volume presents a comprehensive overview of computational modeling from both solid mechanics and fluid dynamics perspectives.